I've been with my son before (a couple of times last year), which amazingly for a boy of just three, he remembered. It was however granddad's first visit. First things first - finding the park was relatively easy, despite my satnav being out of date and not having "Livingstone Drive" in the computer. Parking was also easy - and free. The park is really divided into two main zones. The first area contains dinosaur-related attractions. The main "rides" are a tower which goes up and down and lets you get a clear view of the park, and a boat ride. 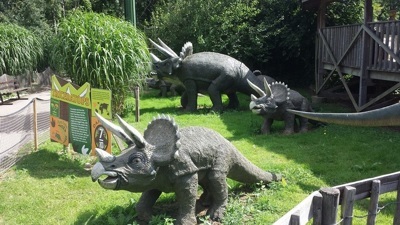 There are a large number of model dinosaurs about to look at too. Also in the dinosaur area is a dinosaur-themed play area, and sandpits where you can dig for "fossils". This was a massive hit with my son, as he's recently seen an episode of Bob the Builder in which they dig up various dinosaurs, and has been desperate to do the same (to the point of digging up our lawn!). 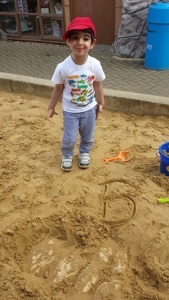 We returned to the sandpits four times, so I can only hope, for the sake of my garden, that he has worked this out of his system! The farm area contains real farm animals, a tractor ride, and some other attractions. There are also various ride-ons scattered around the park - and in between the dinosaur and farm areas is a digger ride-on section which was also a massive hit. The park was clean, staff friendly, toilets clean, and prices reasonable. All in all a good day out. My son said it was the "best day ever" - so I think, money well-spent!